Belton Reservoir is located on the Leon River in Bell and Coryell counties, 5 miles northwest of the City of Belton off FM 317. It is 12,300 acres. Belton Lake was constructed by the U.S. Army Corps of Engineers to control flooding within the Brazos River Basin. The lake also functions as a water supply for several of the surrounding communities, fish and wildlife habitat, and provides recreation opportunities for the public. Most of Lake Belton's shoreline is very steep, rocky habitat. Majestic tall bluffs and long rocky points are most common, although sand and mud flats can be found up the Leon River and Cowhouse arms. The lake has little or no aquatic vegetation. Timber is also limited. Largemouth bass fishing is at its best from late February through April. As the water temperature begins to rise, bass become more active and prepare for the upcoming spawn. The backs of creeks and coves, protected from the north wind, provide the warmest water on the lake. Good creeks to target are Cedar, Bear, Owl, Stampede, and Cowhouse. Spinnerbaits, plastic lizards, jerkbaits, and jig and pork combinations are the preferred baits. From May through September look for bass on main-lake points and flats next to creek channels. Stickbaits, chuggers, buzzbaits, crankbaits, and plastic worms can all be productive under the right conditions. From October through December, bass can be caught from the same areas as during the spawn. Smallmouth bass are generally caught from the dam to the Cedar Creek area at mid-lake. Early spring and late fall, when the water temperature ranges from 55 to 65 degrees, is the prime time to target smallmouth. Spawning occurs in rocky coves protected from the north wind. During summer and fall, long, gently sloping rocky points are good areas to fish. Deep diving crawfish-colored crankbaits, stickbaits, chuggers, buzzbaits, grubs, and small jigs are usually the most productive. 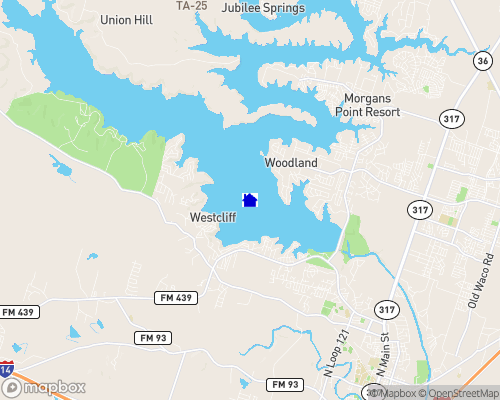 Hybrid striped bass were first introduced to Lake Belton in 1977. Since that time they have become a very popular sportfish in the reservoir. Hybrid stripers tend to travel in schools throughout the main lake. They can be caught using a variety of methods, including bottom fishing with live bait as well as trolling jigs and crankbaits, with or without the aid of downriggers. White bass fishing is best from March through May when they migrate up the lake into the Leon River to spawn. Bank or boat fishing from the Highway 36 bridge north to Mother Neff State Park using small jigs or spinners can be very productive. During summer and fall, white bass sometimes school on the surface. White crappie fishing is best between late February and the middle of May. At this time, crappie move into shallow water in the backs of creeks and protected main-lake coves. Spawning crappie are fairly easy to catch on live minnows or small jigs fished around stumps and submerged cover in 2 to 5 feet of water. In summer, fall, and winter, crappie can be caught around large isolated trees and submerged brush in water depths of 5 to 20 feet. Catfish are best in the spring and summer. Channel cats spawn from May to June, during which time they move into water 2 to 5 feet deep in the backs of creeks or along flats just off the river channel. Shad, shrimp, blood bait, and stink bait all work just fine. Blue catfish were recently stocked into the lake, but only time will tell whether a fishery will develop. The Corps of Engineers maintains 11 parks with boat ramps, picnicking, camping, and bank access for fishing. Three marinas offer basic supplies and fuel. An entrance fee is charged at most parks. Courtesy docks are provided at boat ramps. Mother Neff State Park The main activities are camping, hiking, picnicking, fishing from the river bank, and wildlife observation. The park provides a junior ranger program that allows children from ages 4-12 to earn a special badge & certificate. For interested hikers a tree guide is available at the park headquarters which provides a self guided tour along the lost trail. Facilities include campsites with water and electricity; campsites with water nearby; primitive campsites; a group primitive area; picnic sites; a group (wooden) picnic pavilions and a group (rock) picnic pavilion that are often used for reunions, church group gatherings, and weddings; a heated and air-conditioned recreation hall with kitchen facilities; restrooms with and without showers; a playground; and an outdoor sports area. Nearby attractions include: Texas Ranger Hall of Fame Fort Fisher Municipal Park in Waco; American Railroad Museum and Scott and White Hospital in Temple; the Grove Country Life Museum.